2 1/2 weeks later he went missing in Nakuru, Kenya. On April 30th his wife, Faith, told us he had been murdered. Dennis left behind a 3 year old daughter (Nadya, now 7), and a baby waiting to be born, the daughter that he would never meet (Dennice, named for her father, and now 4 years old). Dennis and Faith worked to send their eldest daughter to a private school (Marion School Nairobi) at a fee of Ksh 228,000 (US$2,280) per year. (The youngest is not yet old enough to attend). School supplies and books costs about another $130 per year. The cost of this schooling has become a tremendous burden on Faith as a now-single parent. Today I’m asking you to join me in creating a safety net for our brother Dennis’ daughters. “Binti” means “daughter” in Swahili, hence the name of this project. The first goal is to raise 125,000 Kenyan Shillings to cover the term that is about to start in May, through the rest of the current school year. This campaign is in Canadian dollars, so the goal has been adjusted to the equivalent $1,750 plus an additional $100 to cover PayPal and Western Union money transfer fees to Kenya. I’d like to set a second goal to establish a proper trust fund to ensure that Dennis’ and Faith’s daughters’ education is covered right through graduation. It’s a big goal, but I know we can find a way to make this happen, and I’d be so grateful for any guidance you can provide as we wrap our arms around this family to continue doing what Dennis would have done if he was still here with his wife and daughters. There are 2 ways to help. 1 helps you too! From now until the end of May, I will be donating 50% of my income from WordPress training, development and support to Dennis’ daughters. When you purchase support hours through my online shop, half of what you invest into your business’ web site will be invested into their education, immediately. You get training, development and support. Some wonderful little girls get a really important education. Don’t need WordPress support for yourself or your business? 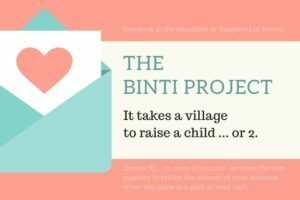 You can simply make a donation by purchasing a Binti Project – Tuition Sponsorship pack, for whatever amount your heart desires. 100% of that money goes directly to Dennis’ daughters’ education. Dennis’ and Faith’s eldest daughter is due to start her next term at the beginning of May. That’s just a little more than a week away at the time I’m writing this note. Whether you can toss a dollar, or ten, or maybe even more into the digital tin cup, every single one of them will matter. I’d like to be able to wire the first payment to Faith by the end of April so her daughter can stay in school. 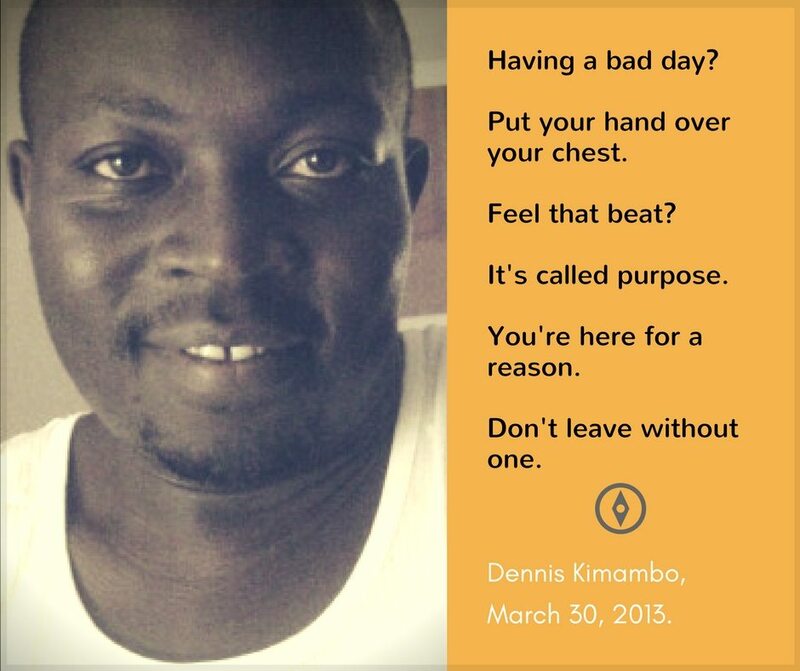 While the Omidyar.net community where we were better world scouts with Dennis is now gone, we can still be that virtual village to help raise a child. 2 of them in fact.